Customer churn is unavoidable. I have written before the futility of chasing 100% loyalty from customers. Simple reason is – change. Customers change, their needs change, norms change, technologies change, and competitors change. When such changes happen some fraction of customers stop buying all together, switch to competition or your product becomes irrelevant. Every business needs to build in a certain level of churn in its future growth and plan to continue to grow installed base of customers despite losing some. 50% of your customers stop using your product, close to 30% in the first 3 months? Your whole valuation is based on growth, showing triple digit user and revenue growth year over year for next several years? When you have really just one product? 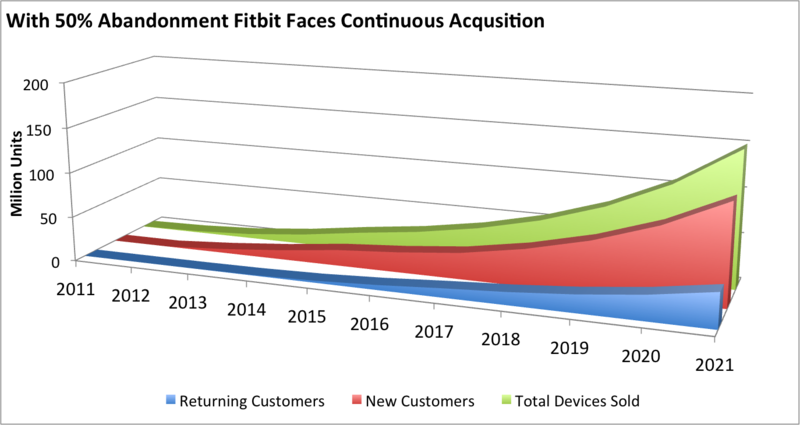 That is the case for Fitbit. First it is a product that customers should want to buy and not a necessity. Second customers lose interest so quickly. Third even among those who want to buy the band it is facing competition from low and high ends. If it has to show even a modest 40% growth over next five years it has to get that all from acquiring new customers. Think of the effect of this on its marketing dollars. How many more campaigns it needs to run? How many new markets it needs to break into and the cost of market entry? What is the ROI on all these marketing dollars when only 50% return and spend less and less over lifetime. This is not to repeat the fact the product itself does nothing really to fitness despite the name. It will be interesting to see heart rate data of its shareholders over the next few months. Should Your Business Run Groupon? All rights reserved (2008, 2009, 2010,2011). Fair use provisions apply. No complete reproduction allowed. When quoting, you must refer the author by full name and link to this blog.